I wanted to look at how much the “clipping” behavior of power-limited solar microinverters affected my annual energy production. The TL;DR version is: at worst, only about 0.6% loss due to clipping. For more, read on. A photovoltaic inverter is a device which converts the DC energy from the panel into AC energy for the grid; it also manages optimum power point tracking. Traditionally this was done with a big central inverter for all panels combined; recently companies such as Enphase Energy have started making microinverters, which are per-panel devices. One advantage of these devices is that each panel operates independently so that if one panel is shaded, damaged, or dirty, it doesn’t affect the rest of the array. So from the graph above it’s clear that I am losing a little energy production during that clipping. What would normally be a smooth curve is flattened out at the top as I hit the 11x199W = 2189W limit. (A few factors affect whether this clipping happens; obviously we need a clear day, but optimal sun angle and, perhaps more than anything, panel temperature affects it greatly). I wanted to try to quantify this a bit – how much am I really losing from this behavior? 107 2184,"enwh" <-- actual clipping start? There’s a pretty big jump at 2184W, so I went with that as a definition of “when clipping starts” vs. the nominal 2189W. Adding up the occurrences of clipping, I got 708 5-minute intervals of clipping out of the last 365 days. That’s about 59 hours. So how much energy is that? My panels can nominally make 11x230W = 2530W of output, so 2530-2184 = 346W lost, at most, during clipping. That’s actually too high; not every instance above is clipping, and not every interval would have been making the maximum output. So we’ll take that as a high estimate. 346W x 59 hours is 20,414 watt-hours, or about 20kWh. At around $0.10/kWh, that’s about $2.00 of lost value. Over the same year period, my array made 3,356 kWh, so 20kWh lost is about 0.6% of that. I would hope that the microinverters made up at least that much by virtue of keeping the array going over the winter when some panels were snow-covered, etc. Remember, many of my assumptions above make this a high estimate. March was far and away the highest; this is probably due in large part to the cooler temperatures, which make the panels more efficient. This entry was posted in Energy, Monitoring, Renewable by Eric Sandeen. Bookmark the permalink. Great job on the analysis. I have heard that the Enphase micros report a slightly high output in general. Have you been able to measure their reported vs. Actual energy generation? There have been some reports & threads of the Enphase units reporting higher total production than the attached utility production meter. Indeed, my microinverters report a total of 9549 kWh and my utility production meter says 9333 – a 2.3% difference. But I’ve not tried to verify one or the other with a 3rd measurement. The Enphase microinverters are not designed to be revenue-grade meters, and probably have only a 5% accuracy or so. It’s also true that we lose a little in the wires between the microinverters and the meter (line loss), something I haven’t calculated. (I’m not even sure what gauge wires I’ve got between the array and the meter, TBH). Nice little article. You need to do some calculas to try to figure out what the area under the curve might be. Also your panels could be producing more because they are running below the Normal operating temp. So your number’s may not be to over the top. Not sure what your main point is about the lower temps, though? One of the additional reductions in metered measurement of generation, associated with grid-compliant / grid-connected inverters, may be due to the fact that they actually ‘consume’ a small amount of energy to monitor the grid. Some bi-directional meters may take this consumption into consideration and report ‘net generation’ vs. ‘gross generation’. P.S. For my 4.24 kW (DC) system consumption is inconsequential as my 16 Enphase M215 micro-inverters, according to my local utility company, consume ~ 1 kWh per 2-month billing cycle. For larger systems consuming more, this amount may be of greater significance. We are going to install our system soon. I like the concept of microinverters and Enphase is the clear leader with local installers. While researching I have come across a number of blogs regarding 190 and 200 inverters indicating less than ideal reliability and poor customer service when attempting to have problems addressed through warranty. The 215 and soon to arrive 250 inverters have an advertised 25 year warranty, but may not be worth much if you have to fight for months to get it honored (if at all). Interested to hear any impressions of reliability and company responsiveness to customer or installer for warranty claims. Thanks! I’ve had 11 M190s on my roof for 3 years. I’ve had 0 failures while on the roof. When I had some panels removed for roof work, they found one inverter had been cracked off its mounting bracket. By all indications the original installer had stepped on it and damaged it. Nonetheless Enphase offered to send me a replacement under warranty. So in my case, it’s been all satisfaction with Enphase. Another place to look for first hand Enphase experiences might be the Wind & Sun forums. I would expect that reliability would continue to improve with the newer models, as Enphase learns from any failures in the field. FWIW, I’ll update this: I had one M190 fail. Not a 100% failure, but it started topping out well below 199W. After a little bit of hassle with Enphase, they did replace it under warranty. My system (33 LG panels of 305 rated peak watts) and Enphase inverters is going in on Monday, so I have zero personal experience so far. I did have the very same question re “why use higher rated panels if the microinverters can’t handle the output” and in researching it I found a couple of interesting things. First is, as stated above, it doesn’t happen very often. Second is that the higher efficiency panels are supposed to deliver a bit (7-8%) more power under any given condition, so average power generated during the year should be higher when not clipping. That makes sense to me, but we’ll see what happens. I’m installing both revenue grade metering and a “near revenue grade” WattNode metering system hooked to my home energy web site that I use to track geothermal. So, I’ll be keeping track in detail and will add my results to the dialog when I get something meaningful. Thank you for posting this! Good job! 1) Have you had any more inverters fail in since your last posting? 2) Have you since updated your clipping calculations? 3) In what city/state is your system located? 4) Exactly what panels are you using? 5) What is your array’s azimuth and tilt angle? I have had 1 inverter fail in about 4 years. I haven’t had a need to update the clipping calculations… The array is in the Twin Cities in Minnesota, with 230W Siliken Energy panels. The array points due south, and at the time I posted this the angle was about 45 degrees, roughly equal to latitude. Found your blog when researching M190 inverters. It has been a great help in my decision making for my own system as your system is near identical. As I am on a limited budget, I decided to pick up some used M190’s to go with my 14 Sharp 230W panels. I am located near Houston, Texas so I should have a bit more sun available than MN. I am hoping the results with my system will meet or exceed yours. We shall see. Thank you again for taking the time to gather the data and post the results. The clipping may be due to the internal MOV used to limit the maximum output of the inverter. I had an M175 fail and could not get any customer service so I decided to repair the unit myself. I have made a schematic and the failure was due to a bad optic isolator. The failure resulted in the destruction of the internal MOV. I could not find specs on so I experimented with what I expected to be the correct values. I found that the original value is about 12volts too low. By using a slightly higher V rating my M175 now puts out published power. 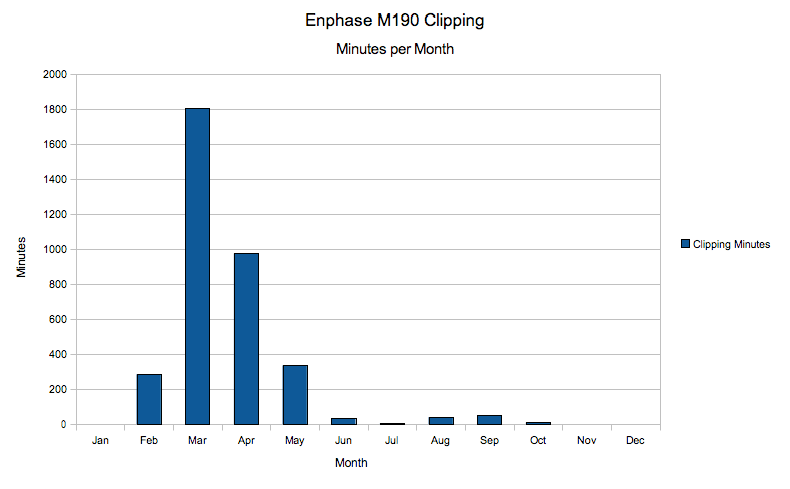 My M190’s clipping at 199W is actually within spec; the M190 is nominally 190W, but maxes out at 199W. That’s actually above what the spec sheet says. Details like Geo location (latitude), temp, azimuth, and angle make huge difference in solar module output. Assuming that all were “perfect” even then the solar module will never output the nameplate value. In your example 230 Watts. The name plate value is a testing standard in a perfect environment that will never occur in real life. You must derate the module output, thus your calcs showing loss during clipping are not accurate. That said there is nothing wrong with clipping. I’m a solar PV contractor and often the customers electrical main panels capacity might limit the size of inverter(s) (micro or central) we can install. But customer production demands are greater than inverter. So we will intentionally design with a smaller inverter that the electrical panel capacity can handle. And then a larger solar panel array than inverter(s) designed with intentional clipping.the advantage here is larger yeilds (production) before and after clipping. Or larger yeilds in morning and evening making for overall larger yeilds per day and annual. Sure. My point was to show that even compared to maximum theoretical output, the clipping due to the microinverter limit is negligible. Thanks for sharing this information. It was helpful to me for a diy installation of 6 230w panels using m190 micro inverters without a monitoring Envoy installed yet. The system is only about a month installed and I measure output sporadically with an amp measuring clamp meter. Under a really clear and sunny sky, mid-March, I measured way less amps than I expected, lower than a much less optimal day a week earlier. This helps to explain what I observed. May I extrapolate that it is caused by panels putting out more power that that inverters can handle? The inverters will never put out more than 199W, so … if that’s what you’re seeing under full sun, you’re good. Eric — I used to regularly read your comments and posts on the old Enphase community before that was taken down. Just wanted to add a comment regarding reliability. I have a system with 16 micro inverters M210 connected to Sunpower panels. This was installed in 2011. Of the original 16, only 6 still remain. Not sure if my inverters came from a batch with poor quality control. Enphase quotes an MTBF of 300 years. Based on my experience and a back of the envelope calculation, I would say this number is closer to 10. Just glad, I chose a reliable installer who is good at following up with Enphase. Anyone know how to edit your array to remove a failed inverter? Array build is no longer available to be. No tweet, only facebook, and I have just started to make some noise. As of late Enphase give no support to there small customers.